University of Newcastle’s Professor Craig Pennell, is the newly appointed Chair of the Red Nose National Scientific Advisory Group. Red Nose provides vital safe sleeping education to expectant mothers, their families and healthcare professionals all around Australia. It also conducts research into sudden and unexpected death in infancy and provides crucial bereavement support to those affected by the death of a baby or child, receiving more than 10,000 calls for support and education every year. 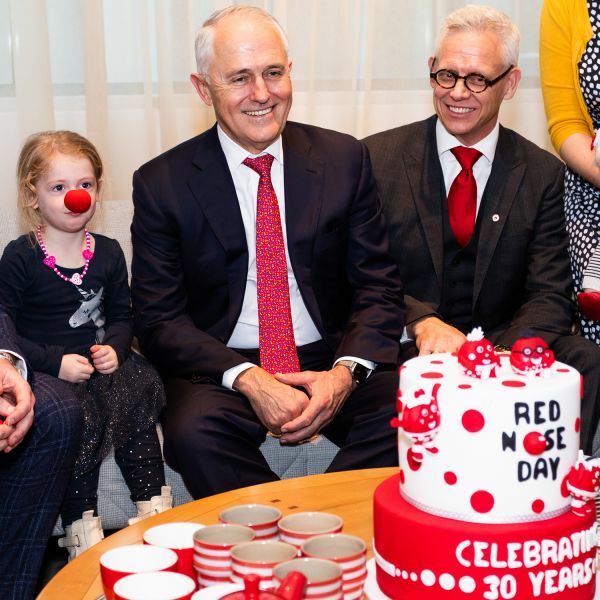 Professor Pennell*, the University of Newcastle’s Chair in Obstetrics and Gynaecology, and Professor of Maternal Fetal Medicine, met with Prime Minister Malcolm Turnbull last week at Parliament House, as the national charity celebrated its 30th Red Nose Day and its flagship fundraising event. Central to the celebration was a two-tied cake representing the two grassroots services offered by Red Nose – Safe Sleeping Education and Bereavement Support. Mr Turnbull was joined in the cake cutting by Red Nose Board Chair and Partner at PwC Craig Heatley, Red Nose Head of Health and Advocacy Jane Wiggill, and Professor Pennell. The National Scientific Advisory Group (NSAG) is an Education and Research Committee whose role is to recommend research initiatives, identify gaps in Red Nose education and grief and loss policy and to ensure education messages stem from evidence-based research. NSAG reviews and recommends research development, research initiatives and public and health professional educational campaigns, as well as providing advice to Red Nose on the projects that best fall within our research funding protocol. * Professor Pennell works clinically as a subspecialist in maternal fetal medicine at the John Hunter Hospital and is a principal researcher at the Hunter Medical Research Institute (HMRI). Professor Pennell has managed high-risk pregnancies as a subspecialist for more than 15 years in Canada, Perth, and now Newcastle. His clinical work focuses on preterm birth prevention and pregnancy after stillbirth; he has managed more than 1500 women’s pregnancies after stillbirth.